Powered by Pantropical and organized by Aloardi and Idraola. Following last year’s successful debut edition, Aloardi Festival is back at WORM on Saturday 28th October. Tipped by Gonzo Circus! Dive deep into Peruvian New Music and Arts! Aloardi Festival 2017 offers a multifaceted programme that comprises an exhibition, a symposium and a video screening, culminating in an enticing mix of exclusive live performances and DJ sets. At the invitation of Aloardi this festival presents the work of contemporary Peruvian artists, musicians and DJ’s, boasting different aspects of the current Peruvian underground. Expect mesmerising Andean folk from the highlands, gutsy sound experimentalism, highly danceable chicha/cumbia, tropical bass & much more. Full details of the artists and the festival can be found at the festival Facebook page. – Video screening – selection of Peruvian video art. – Symposium ‘Worldviews, music and arts in contemporary Peru’. – Opening exhibition by Felipe del Alguila. – Concerts, live visuals and after-party with Andean Harp, Harsh Pop, Cosmic Electronics, Huayno and tropical bass. – Merchandise from independent music labels: Superspace Records and Aloardi. Visual artist Felipe Del Aguila has been granted an artist-in-residency as part of the Aloardi Exchange Programme. His solo exhibition, ‘Connection-Disconnection’ will conclude this residency. Isabel Huayanay is a talented harpist and singer who was born in Lima. 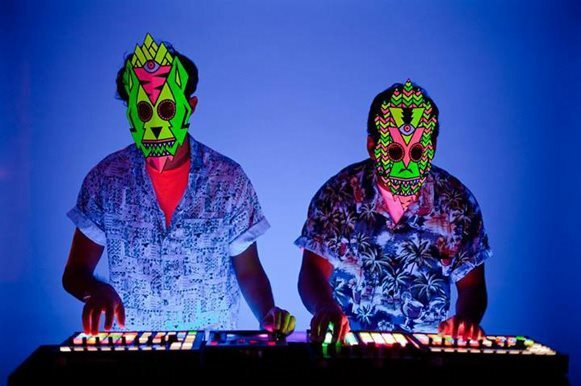 Duo from Lima, known for their highly danceable fusion of modern electronics and tropical rhythms. Tica formed in 2003 in Lima. Members Fabiola Vasques and Chrs Galarreta were previously active in influential bands such as DiosMeHaViolado, Evamuss and Lapolarina. Wilder Agreda’s prolific work and characteristic musical ethos makes him one of the most interesting figures in Peruvian independent music and sound art. Sonido Martines is one of the head honchos of the South American tropical music scene who is originally from Argentina. Pira Lemu is a Peruvian artist whose radical DJ mixes sometimes seem to double as sound essays. Jonathan Castro is a graphic designer and musician from Lima. 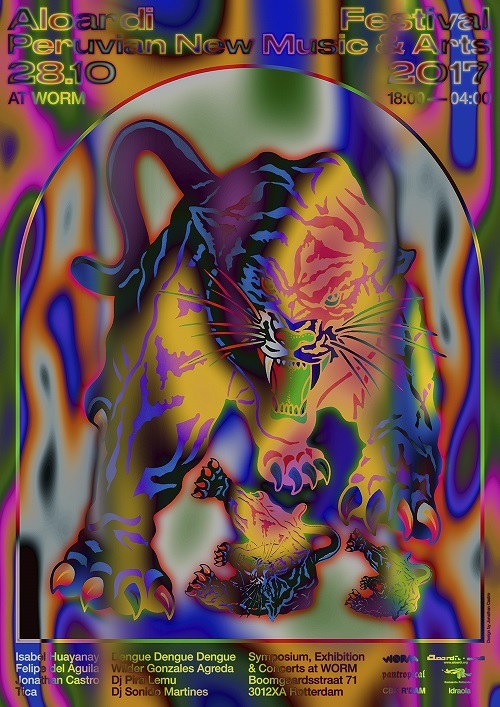 He designed posters for various Peruvian musicians and international artists like Sonic Youth. Aloardi Festival is organised by Aloardi and Idraola, and powered by Pantropical as part of the Aloardi Exchange Programme 2017. Supported by WORM, Gemeente Rotterdam and CBK Rotterdam. Thanks to ‘Residency …at the Waterfront’ and WORM Sound Studio. Design by Jonathan Castro.